Proper, technically-advanced brainfloss from two of the world's most fastidious n0!se provocateurs, Russell Haswell and Kohei Gomi (Pain Jerk, Incapacitants). Their long-awaited collaboration 'Electroacoustic Sludge Dither Transformation Smear Grind Decomposition n0!se File Exchange Mega Edit' has, in effect, been in-the-works since the duo first met at Tokyo's legendary 20000 Volts venue, back in 1997 and registered intent to work with each other. Fast forward 15 years to 2012 and the duo were prompted by a joint booking at Nottingham's Rammel Club to exchange files and build a corpus of material for their "extreme duet tag mass attack". The performance was subsequently recorded and they spent the last two years re-editing and re-contextualising it into these two solo pieces. The results are two demixed "punk academic" studies on the edit process, employing advanced computer music techniques and analogue/modular synthesizer splatter to deform, channel and reframe the energy of freeform, improvised noise consummation. 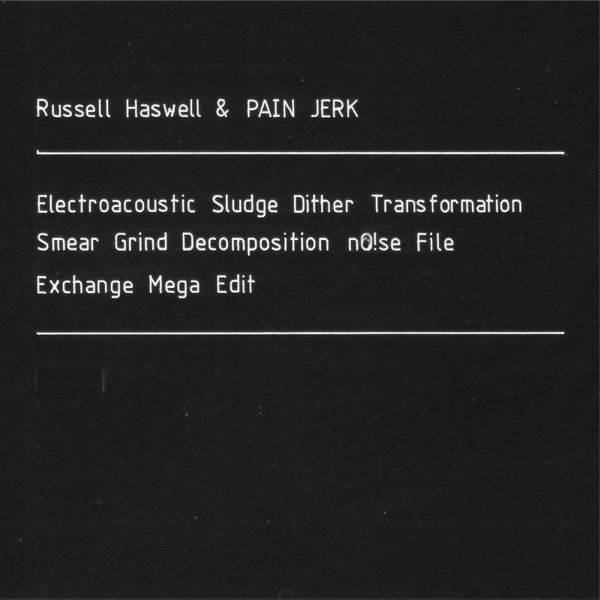 In terms of duration and detail, Russell's 72 minute disc is the more fearsome and engrossing, relentlessly shape-shifting between fracked rhythms, face-melting distortion and indescribable psychoacoustic timbres with a meticulous, non-linear flux. Pain Jerk's 35 minute 2nd disc, whilst similarly unstable and uncompromising, follows an equally idiosyncratic logic, concentrated more on 3D spatial convolutions and prone to sustain certain sounds for optimal intensity and visceral, psychedelic effect. Not to be missed.